As I’ve said more than once before, Pride and Prejudice is my favorite book of all time and I keep a close eye on adaptations. I may not like every version of the story people cook up, but I love weighing them against each other and seeing what tiny improvements each version can make. Just recently I rewatched the Keira Knightley movie, and while I find almost everything in that version to be not quite as good as the 1995 BBC mini-series, I was reminded that the movie does a GREAT job of using clothes and houses to really play up the class differences between the Bennets and the Bingley/Darcy crowd. Anyway, when I saw that Curtis Sittenfeld’s latest book Eligible was a modern version of Pride and Prejudice, I was very interested. Sittenfeld is probably best known for her first novel Prep, about a girl at a New England boarding school. I actually thought Prep was incredibly grim and unpleasant to read, but I quite liked American Wife, which was an imagined, fictional version of Laura Bush’s journey to become a somewhat unwilling First Lady. So I went into Eligible fairly ambivalent about Sittenfeld and I’m still not sure how I feel, although did enjoy the book. There’s no point summarizing the plot–this is a very loyal retelling of Jane Austen’s classic story about the Bennet sisters, moved forward in time to modern-day Cincinnati. To be completely honest, I went into the book thinking that there was no way anything could live up the Lizzie Bennet Diaries–I LOVED that video adaptation of the story and I couldn’t imagine another modern telling matching up. But Eligible did win me over, at least a bit, as it went along. In the books, the Bennet sisters are in the 15-21 age range and most modern updates up that a bit to make everyone legal, but even my beloved Lizzie Bennet Diaries only puts the older girls in their late twenties. In Eligible, Jane is turning 40 and Lizzie is right behind her. Which is perfect! A huge part of the original story is the pressure the girls feel to get married, and that panic rings so much more true in the modern story when Jane and Lizzie are both approaching 40. To me, this was the one thing that Eligible has really added to the Pride and Prejudice oeuvre. Darcy and Lizzie came off pretty hot, actually, which doesn’t always happen. I would say that 90% of the characters, plot, and structure of the book are straight from the source material. The characters have the same names, the chapters are structured the same ways, etc. So when she does make a change, it must mean something, right? There were two major places where Eligible diverged from the original and I am still not quite sure why. First, Wickham is split into two characters, which gives a whole new spin to a couple of key plot points and I can only assume that this is because we all have larger social networks today? Hmm. And second, this book proceeds a bit past where the original ends and . . . again, I’m not sure I see the point. Lydia. Oooh, Lydia is problematic. In order for the plot to move along, Lydia has to do some fairly outrageous things. Jane Austen’s take seems to be that Lydia was, if not evil, certainly dumb and thoughtless; by the end of the book (200-year-old spoilers), Austen seems to have decided that Lydia has made her bed and now she can lie in it. In our previous discussions of the Lizzie Bennet Diaries, we all talked about how much we liked their take on Lydia, which made her much more sympathetic and made her actions more understandable. Sittenfeld’s Lydia is pretty much in the dumb and thoughtless mold, but the way Wickham is now handled makes the end of her story feel quite different. I don’t feel like Lydia has to be sympathetic–a big message in the story is about family loyalty, even when you might not like that family–but it was a significant enough change that it felt like Sittenfeld was trying to make a statement. And I think that statement was, even if you’re dumb and mean things might work out if you have a responsible older sister? I don’t know. Overall, I thought Eligible was snappy and fun to read and if you’re a Jane Austen completist like I am, you’ll enjoy it. But if I am going to recommend Pride and Prejudice-inspired material to someone, this ones falls down on the list under the Lizzie Bennet Diaries, Bride and Prejudice, Longbourn and even Bridget Jones’s Diary. 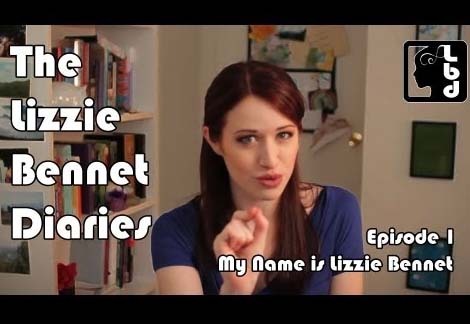 I would not have thought it was really possible to transpose Pride & Prejudice into a modern setting, but then I watched some of the episodes of The Lizzie Bennet Diaries and was amazed. This is the Bennet family in the current time as told through Lizzie Bennet’s online video blog. And it’s delightful! It’s also still a work in progress, still being updated twice a week with new episodes. So far there are 30+ episodes, each between 2.5 and 5 minutes long, and Lizzie and Jane are staying at Netherfield, visiting Bing Lee, his sister Carolyn, and friend Darcy. The translation of the story from the 19th century to the 21st century is both really well done and kind of fascinating. What changes and what doesn’t change is pretty awesome. While the majority of the story is told diary-fashion about off-screen events, some of the events take place while Lizzie is recording the videos and seven characters have directly appeared on camera (so far): Lizzie Bennet, of course, but her also her friend Charlotte who helps with the video editing, her sisters Jane and Lydia, Bing Lee and Caroline have appeared a couple of times, and, in one memorable episode, Mr. Collins. It’s really well done, and it’s a bit like potato chips: each episode is short and quickly watched and yet you can’t just watch one. There’s more to watch and you want to watch them all! Thus, you should go start watching! Here’s the first one. I read a very brief mention of this book a couple of days before Christmas, and thought to myself, “I better put a hold on that at the library.” I promptly forgot, of course, but on Christmas Day my wonderful father had bought it for me! I finished Comfort & Joy while on vacation, so was able to crack open Death Comes to Pemberly on the plane ride home. Basically, Death Comes to Pemberly is an old-fashioned British murder mystery, picking up about 5 years after the end of Pride & Prejudice, centered around the married life of Elizabeth and Darcy. I’m normally a little ambivalent about novels that pick up where other famous novels ended, but a couple of things overcame that for me here: 1) I’m not actually a die-hard fan of Jane Austen, so her writing isn’t as sacrosanct for me as it is for many readers, and 2) P.D. James herself has her own excellent reputation as an author. I have a vague memory of trying to read some of P.D. James’ other novels before, though I can’t remember which ones, and finding them a bit too…technical is the best word I can come up with, though it isn’t quite right. Anyway, her trying to pick up the style of Jane Austen corrects that for me, softening the prose and the characters, and while she can’t write exactly as Jane Austen does, I think she does a fairly good job of capturing the spirit of the characters. Darcy in particular is a surprisingly sympathetic character, and it is actually really interesting to get his perspective on events. A not-too-long divergence: I feel like male characters in regency novels, even those written contemporarily, are often inaccessible. I think it is probably an accurate portrayal—that men at that time even more than now were expected to be stoic—but as I’ve gotten older, I’ve realized how very young some of these characters are, and how unsure of themselves they must have been in spite of themselves. P.D. James actually plays on that a bit, making more overt for modern audiences what Jane Austen might have expected her audience to already know, the responsibilities laid on older sons to carry on family duties at a very young age. I enjoyed the book so much that I hate to even write a criticism (and I’m not convinced that it is a fault of the book), but an odd occurrence happened enough that I can’t quite overlook it. Several times while reading the book, I would turn the page to continue reading, and have to go back and check that I hadn’t accidentally turned two pages together, that there seemed to be the occasional jump in plot. Now, I should qualify this with mentioning that the entire time I was reading this book, I was recovering from a cold and was pretty well dosed with cold medicine, so I can’t say that I was firing on all cylinders, either.